Learn the basics of working with wood. In this class, we will show you the basics of how to create beautiful handmade wooden pieces for yourself. We will help you get your tools into shape and show you how to cut joinery by hand. You will learn how to break down rough lumber, dimension it for use, and produce a finished product. The follow-up class to Fundamentals 1, intended to reinforce and expand upon what was learned in the first class while providing students with a breathtaking finished piece. We will begin with the most important step: the plan. After understanding the steps involved, we will set out acquiring pieces paying close attention to wood grain. 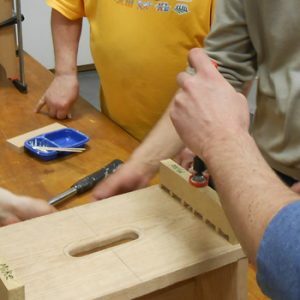 Making more thorough use of the mortise and tenon, and later making a proper drawer box, including turning your own knob, students will each assemble a cherry shaker-style end table. A beginning class to knowing how to make any kind of cabinetry, wherein the class as a whole collaborates to make a simple set of 'institutional' cabinets made of melamine (a sort of plastic-coated particle board). 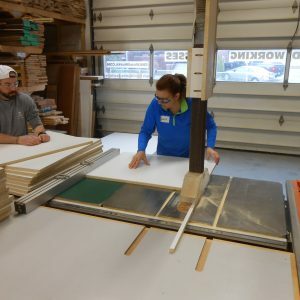 Intended to familiarize all students with the use of a table saw and breaking down sheet goods, you'll learn how to cut square parts, install T-mould, assemble a cabinet box, and finally install hinges and drawer slides. 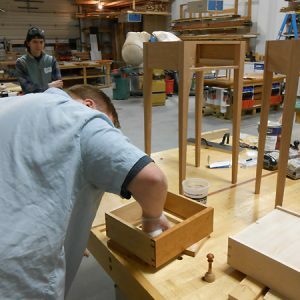 The second, slightly more involved class teaches students how to make a solid-wood-face-framed cabinet with frame-and-panel doors and drawer face. While much of the construction is the same, the incorporation of solid wood presents its own challenges. 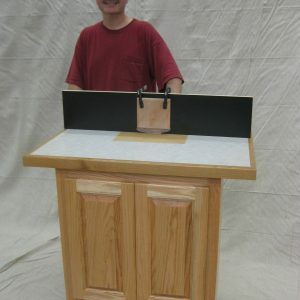 Each student will make a cabinet for themselves, many choose to make it a router table. A class intended to show the basics of working with veneer and creating a veneered piece in which students make a veneered chessboard. After learning the basics of cutting veneer and matching, students will learn the basics of parquetry, or making geometric shapes. 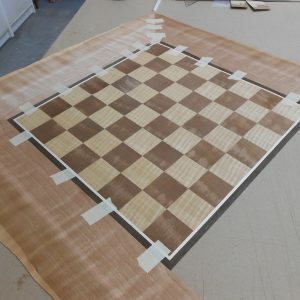 They will use the parquetry to create the chessboard playing field, then add a border and glue the piece together.